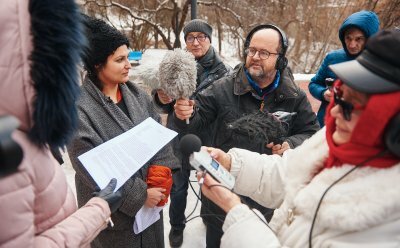 ‘UA/UK Radio Drama’ – is a professional program of events which is created by Mystetskyi Arsenal, the British Council and National Radio Company of Ukraine. This joint British-Ukrainian project designed to promote the development of the radio drama genre in Ukraine. The first radio dramas in Ukraine were dated back to the 1930s when radio broadcasting, along with literature, was a powerful tool of propaganda. In the Soviet Union, radio plays were called 'theater in front of a microphone' and they were first broadcast live, and were recorded later. Nowadays, in Ukraine, the most common is the staging based on artistic prose. However, radio drama as a genre remains irrelevant, not trendy. Young writers almost don’t work with it, and new works are created without taking into account global trends. On April 23, 2018, a joint British-Ukrainian competition ‘UA/UK Radio Drama’ was announced. 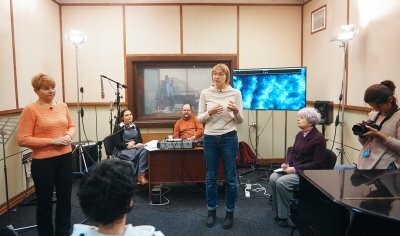 Mystetskyi Arsenal, the British Council and National Radio Company of Ukraine offered writers an opportunity to try their hand in the genre of radio drama. To enter the competition, participants had to fill in the online form. In the online form, they had to attach the text and synopsis of the drama in pdf or doc format. The radio drama had to have written in Ukrainian up to 20 thousand characters with spaces. Rules of participation. Application period was from April 25 to June 30, 2018. Here you can find some tips on writing plays for radio from the BBC World Drama. We received 192 applications from all regions of Ukraine. The largest number of applications was sent from Kyiv, Lviv oblast and Kyiv oblast. 143 applications fulfilled the criteria, stated in terms of competition. 42% of authors - men, 58% - women. 88% of applicants are residents of cities, 12% - of villages. Short-listed participants participated in a radio playwriting masterclass (24-27 September 2018), led by British BBC Radio 4 and Radio 3 playwright Frances Byrnes. Participants worked on their scripts, exploring a range of writing and editing techniques. Frances Byrnes loves creating for the radio and its invisible, intimate world. She began as a BBC Radio Production Trainee in 1988. Since 2005 she’s written drama for Radio 3 and Radio 4, fiction and memoir. She’s dramatised cowboy films and classic novels, and even put ballets on air. Later, Matt Thompson from the British production company Rockethouse conducted training on the features of the production of radio play, work with actors, the choice of sound effects, musical accompaniment, and promotion of works among radio listeners. Training was held on November 27-29. 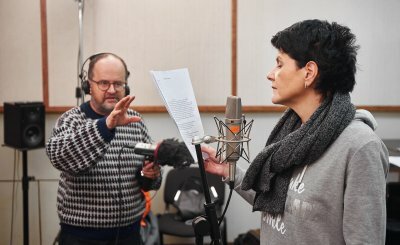 It was a unique opportunity for aspiring directors, producers and sound engineers to gain practical experience in radio drama production from an industry leader. Matt Thompson is a very experienced radio director and producer. He has directed on location, working with actors on the street, in fields, forests but also in high end studios. The purpose is the same: to create totally believable realities from the performance of actors and the manipulation of sound. 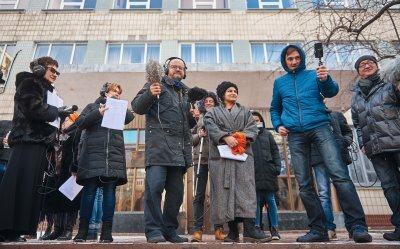 On November 13, 2018, the jury of the ‘UA/UK Radio Drama’ competition announced the winner. Iryna Borysyuk won the competition. Her play ‘The voice’ was produced and broadcasted by the National Radio Company of Ukraine. The play ‘Voice’ is a futuristic story that reveals the love triangle between a woman, an artificial intelligence and its creator. Iryna Borysyuk – a literary scholar, journalist, teacher and writer. She is Ph.D. in Philology, Assistant Professor of the Department of Literary Studies at the National University of Kyiv-Mohyla Academy, Head of the Journalism Department of the "Odnoklasnyk" ("Classmate") magazine. The author of more than 50 literary publications, a manual for students in philology, several dozen stories for teens. The Ukrainian radio also noted the plays of Yana Kostrulina (‘The Seventh Minute’) and Yulia Yemets-Dobronosova (‘Three Minutes of Fame’). The authors will be asked to give rights to the production of plays, which will also be broadcast on the Ukrainian radio. On January 24th, 2019 the premiere of the winning play was held on the National Radio Company of Ukraine. Rimma Zyubina, Andriy Sereda and Olga Gorbach participated in the production of the play. The winner awarded a prize of 25,000 UAH. Listen to the winning radioplay ‘The Voice’ by Iryna Borysiuk. National Art and Culture Museum Complex 'Mystetskyi Arsenal' is a flagship Ukrainian cultural institution that aims to promote the modernization of Ukrainian society and the integration of Ukraine into the world context, basing on the value potential of culture. Synthesis and development of contemporary art, new music, theater, literature and museum spheres are made through exhibition projects and activities of the laboratories. Thus, various arts are developing and enriching each other, while artistic and professional communities find points of intersection and mutual reinforcement. Mystetskyi Arsenal also serves as a platform for interaction with the world's cultural community through joint cultural projects. The National Radio Company of Ukraine is a radio platform of the Ukrainian public broadcaster by the National Public Broadcasting Company. Radio has been broadcast since 1924 and is one of the oldest broadcasters in the world. The National Radio Company of Ukraine is on three channels: the first one is a spoken news sociopolitical, the second – a youth music-talking 'Promin' radio, the third one – the artistic educational 'Culture' radio and has editorial programs in English, German, Romanian and Russian. 'Culture' Radio is the only radio station in Ukraine that works in the genre of radio drama. Every year, there are 215 radio theater releases ('Theater in front of the microphone', radio plays, radio broadcasting of theatrical performances). The British Council is an international organization of the United Kingdom whose goal is to expand cultural relations and educational opportunities. We establish a friendly dialogue and build understanding between people in the UK and in other countries. We do this through a positive contribution to the United Kingdom and the countries we work with – by changing lives, creating opportunities, building connections and trust. We work in more than 100 countries around the world in the fields of art and culture, English language, education and civil society. Each year, we personally interact with more than 20 million people, and cover more than 500 million people online through broadcasts and publications. Rockethouse’s motto is 'Unexpected and Beautiful Radio'. Founded in 1998 it’s a bijou supplier to the BBC specialising in one off documentaries and dramas for UK National Radio and the BBC World Service. They also work with Amazon audible producing sound for long duration audio dramas such as The Jungle Book and The Christmas Carol (with Sir Derek Jacobi) and narrative computer games.